The three stateroom plus crew interior is a great display of Italian workmanship. The helm and dinette, both elevated from the salon level, are divided by the companionway leading down to the three staterooms and the sunken galley behind the helm has an access door to the small crew cabin under the sole. Topside, the spacious flybridge has a retractable instrument console at the helm along with a circular lounge and sunpad aft. Additional features include a spacious engine room, opening helm and dinette side window, and a huge foredeck sunpad. The large cockpit has a teak sole, a split bench seat, engine room hatch and a laundry center. Note that a PWC can be stored inside the extended swim platform. United Yacht Sales New Jersey would love to guide you through a personal showing of this 53' Ferretti Yachts 53 2003. 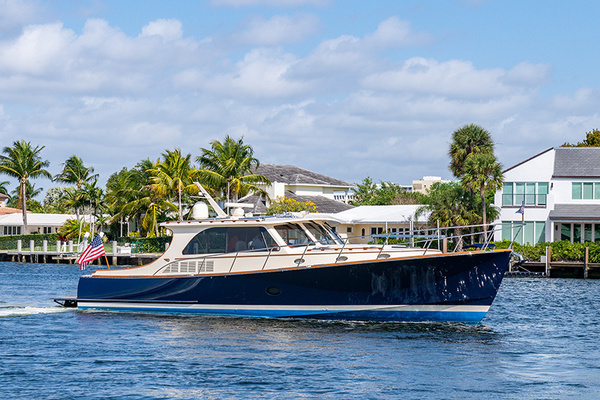 This yacht for sale is located in en-route, Florida and priced at $509,000. For a showing please contact us by filling out the form on this page and we will get back to you shortly!